We’ve never seen a more highly anticipated slot than this one, and whether it was due to the year long wait or the features expected, the Guns N’ Roses title didn’t disappoint. The first instalment in NetEnt’s revolutionary ‘NetEnt Rocks’ trilogy, this slot is jam packed with features and bonus rounds and the unique option to choose the soundtrack which accompanies gameplay – featuring some of the best tracks from the iconic rock band. In Guns ‘n Roses there are 5 reels and 20 paylines – a standard video slot format – a minimum bet of $0.20 and a maximum bet of $100. The graphics are stunning and the audio is something we haven’t yet seen before, with an official GNR soundtrack to keep things rocking along. You can get playing with Axl Rose and Slash on your desktop, laptop, smartphone or tablet from anywhere you can secure an Internet connection. We’re first greeted to an opening which is bound to please the band’s fans with a roaring crowd and the band playing Sweet Child O’ Mine. The best part is, it is a clip of the real band as their actual faces aren’t used on the reels – animated images have been used instead. You can skip the intro, but we advise watching it at least once as it creates an incredible ambience, and once the reels appear a track will commence. You can pick from Welcome to the Jungle, Sweet Child O’ Mine, Paradise City, November Rain, and Chinese Democracy to play while spinning the reels – click the ‘Set List’ button to choose – or you can let them all play through on a loop. We’ve never had the option to choose the audio, but after playing a while you may get over the continuous play no matter how much of a die-hard fan you are. If this is the case, you can mute it via the audio icon in the bottom left hand corner. You can find all the buttons you need to change your coin size and adjust the bet level underneath the reels as well. Despite all the hard work NetEnt put into the title, they’ve opted for the A to 10 symbols for the lower value symbols. However, they have been decorated with roses to tie in with the theme. You need to spin at least three of the same to score a payout, with the top payout for the lower value symbols set at 125 coins by spinning five A symbols. The middle value symbols are represented by the colourful guitar picks, with the top payout of these two symbols set at 200 coins by spinning five of the tabloid print picks. The high paying symbols are the band members themselves, with Axl Rose paying the most at 750 coins by spinning five. Additionally, since there’s quite a few Bonus features, there is quite a few Bonus symbols. The Wild symbol is the games logo and can appear on every reel except on reel 3 if the Appetite for Destruction Wild is activated. It substitutes for every symbol except for the Bonus symbols too. There’s also Expanding Wilds and these cover the entire reel. Then there is the Appetite for Destruction Wild which takes up five symbols over reels 2 and 4 and will give you a free spin and huge wins. Other symbols can turn Wild during special bonus features, which we will detail below. There’s one more symbol to keep an eye out for, which is the the vinyls, and three will trigger a Wheel of Fortune type bonus, where you can activate one of three bonus features. This symbol only appears on reels 1, 3, and 5. The Solo Multiplier sees three or four of a kind wins randomly scoring a multiplier from 4x to 10x – offering huge wins. Crowd-Pleaser Click Me Bonus: There’s three levels to this bonus with the chance to pick three musical instruments in order to advance to the next level and win coins. If you get to level three you will score a 2x multiplier applied to your winnings. You can also get a Free Spin symbol on each level and if you collect all three this will then trigger the Encore Free Spins Bonus too. Encore Free Spins: 10 free spins are awarded with one of the three band members appearing as a Stacked Wild on reels 2, 3, or 4. Additionally, the corresponding band member symbol will act as a Wild on the rest of the reels. You can re-trigger the Free Spins during the feature too. 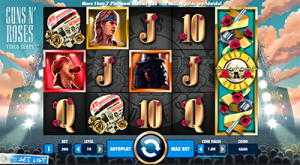 Guns N’ Roses is an incredible slot game and we can see why NetEnt created so much hype around the release. The Expanding Wilds in the base game kept us interested while we spun to trigger the Bonus rounds – randomly or via the three Bonus symbols. When we first triggered the Bonus feature with the Wheel, we pressed stopped and watched as it landed on Encore Free Spins – where we scored an incredible amount of Wilds on the reels meaning huge wins. Once we scored big we returned to the base game and just after a few spins we hit three Bonus symbols again, this time scoring a 6000-coin payout. There’s also random clips of the real band on big wins, which we got when the Appetite for Destruction Wild randomly activated. Overall, this slot is one of the best we’ve played and having the tracks blaring while we spun the reels for real money only added to the overall exciting experience. You can find Guns N’ Roses at Rizk Casino on both desktop and mobile devices. Sign up and you can opt in for the new player bonus of up to $100 plus receive a free spin to use on the lucrative Wheel of Rizk.